When Pesticides are mentioned we automatically think of the huge agro chemical business with all of the negative connotations this typically conjures. It’s hard to think of the relatively low input maintenance of a bowling green as being related to this, but it is and greenkeeping has been heavily influenced by the agro-chemical industry over the last 5 decades. Agriculture and Horticulture are huge industries and an appropriately huge range of companies exists purely to serve them and provide us with everything we need to make our bowling greens better. So far so good then? Well, yes, but only to a point. Over the decades we have grown accustomed to treating symptoms and as a bigger and better range of chemicals has appeared on the back of agricultural research we have adopted the attitude of large scale farming. That attitude says that we should take out all of the doubt and risk that is inherent in Nature and try to circumvent this through the use of clever landscape designs like USGA specification greens and management tools like artificial fertilisers and pesticides. I hold the opinion that this approach is flawed and that bowling greens can be better prepared and maintained if we take the view that they are eco-systems in their own right, existing and dependent on the larger eco-system that we all live in. So today, as an introduction to the massive but fascinating subject that is Ecology, I want to discuss briefly the subject of pesticides and their use in bowling green maintenance. Chemicals can affect the soil and the micro-organisms contained within it. Of course, in some cases this is exactly the effect that is required. Fungal pathogens such as those responsible for Fusarium disease in turf are micro-organisms and we might think, that logically, it’s a good idea to be rid of these. All bowling greens play host to a population of micro-organisms numbered in the billions and this can be split down further into smaller groups such as fungi, bacteria and nematodes, all of which have a role to play in maintaining a healthy bowling green. If we set our theoretical microscope to zoom in on just the Fungi for a second, we would see that along side potentially harmful fungal pathogens like fusarium there are many other fungi that are actively beneficial to the grass plant; in some cases helping the plants to extract essential nutrition from the soil. If you read the label on your turf fungicide you will see that it is probably a Broad Spectrum fungicide, which means it will kill most of the fungi it comes into contact with, many of which are not only superficially beneficial to the grass plants, but essential to maintaining turf health. This is one of the major reasons that the pattern of maintenance illustrated by the Circle of Decline is deeply flawed. A key term in ecology is Niche, which describes the conditions required to favour a single organism. The organism that we are trying to create the ideal niche for is the fine grass that makes up the surface of our green. That niche will include a huge number of elements in balance and where this type of surface appears naturally such as on the Machair of the coastal zones, defined by free draining soil that supports a narrow range of plants able to withstand close cropping by grazing animals, Nature makes a pretty good job of maintaining this with very little human intervention. Back under the turf, if we zoom in a bit further and focus just on the tiny (in terms of the mass of micro-organisms) fusarium population in your green. This specific fungi is always there. When disease breaks out on your green it isn’t because the visiting team brought it in on their shoes, it’s because for one reason or another we have tipped the balance in it’s favour for a while, have weakened the dominant organism (grass) and created a temporary (or sometimes permanaent) Niche that favours fusarium. The result can be devastating. It might seem obvious that what we need to do is eradicate the fusarium, but that would be to take a very narrow and uninformed view. It’s likely that fusarium plays an important role in the eco-system of the bowling green that we just aren’t familiar with. If we concentrate on keeping the green free of potentially harmful elements, we will become plate spinners, never quite attaining our goal of an entirely clean green. This is only the tip of the iceberg in ecology relating to bowling green maintenance. A good big scale analogy that we can see without a microscope and is easier to understand maybe is the proliferation of red deer in the Scottish Highlands. Ecologists, foresters, sheep farmers and sporting estate owners have a big problem. There are just too many deer and the eco-system is out of balance. The pest in this analogy is the red deer and one potential pesticide could be the sporting gun, some of which is beneficial financially to the sporting estates who sell the shooting rights. However, the problem is much bigger than can be handled by deer stalking alone and it continues to cause a massive problem for landowners. Forestry plantations are decimated and regeneration is only possible with the aid of hugely expensive fencing schemes. The root cause of the problem was the eradication of top of the food chain predators like the wolf and lynx in favour of large scale hill farming of sheep, meaning that large herbivores like the red deer have no natural predators to keep their numbers in check. Even today, the remaining apex predators like Golden and White Tailed Eagles are persecuted for taking occasional lambs. In nature the balance is kept, but there are sometimes casualties. Our water supply is taken from rivers, reservoirs and other natural water sources. If we allow chemicals to enter waterways we can ingest them directly or indirectly in the animals and plants that we eat. It’s not easy being at the top of the food chain! 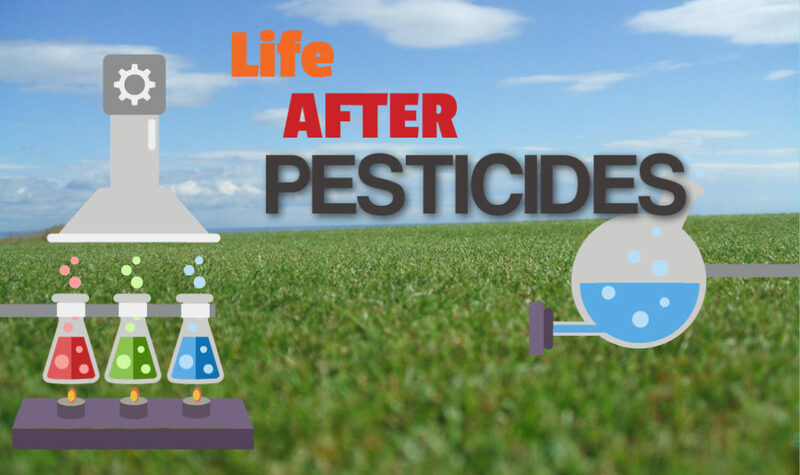 Some pesticide residues are proven to be responsible for diseases and disorders in humans. Of course, bowling clubs aren’t big players in this, but the principles are important to understand. What goes around comes around and we need to apply water to the green sometimes and of course we want to maintain our own health too. Good turf maintenance practices allow us to reduce the need for chemical control and even when we do need to resort to pesticides we can reduce the risks by using safer, more modern formulations, by spot treating instead of blanket applications, by using the safest (low hazard) chemicals under good weather conditions and at carefully calibrated rates. Through these measures, the negative effects can be minimised with reduced chances of chemicals being washed into drains and waterways. Preventative spraying of fungicides (before disease attacks) is very costly and should never be practiced due to the hugely detrimental effect to the bowling green eco-system described above. Overall I firmly believe that bowling greens can be maintained without pesticides, but that doesn’t mean that every club can do that starting tomorrow. Most greens are at some stage of the Circle of Decline and need the carefully measured support of pesticides during the recovery period. This is part of a fundamental change in the approach to bowling green maintenance that has proliferated in the last 4 or 5 decades. The Performance Greens Program that I have promoted for many years is based on greenkeepers having a good understanding of turf/soil ecology and acting accordingly to promote an entirely natural ecology driven maintenance program. Fortunately, a significant side effect of this approach is a green that performs to a higher level of performance and that can be prepared in this way consistently, predictably and economically. Next time I will explain some of the key ecological terms that Performance Greenkeepers need to understand.